US officials have revealed they are investigating about two dozen suspected examples of medical equipment vulnerable to hack attacks, potentially putting patients’ lives at risk. 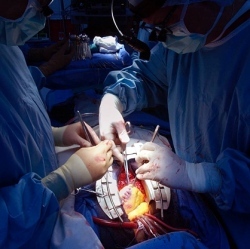 The products include heart implants and drug infusion pumps, according to a report by the Reuters news agency. Investigators were concerned that flaws in the kit could be used to cause heart attacks. There are no known examples of deaths having happened this way. One expert suggested that investigators’ efforts would better channelled elsewhere. But the Department of Homeland Security indicated its fears were justified. "It isn’t out of the realm of the possible to cause severe injury or death," an unidentified government official told Reuters. "These are the things that shows like Homeland are built from." The TV series Homeland featured a plot in which a fictional US vice-president was targeted via his pacemaker.